In 2007, Rufus Wainwright released his homage to Judy Garland, so now it’s only fair that sister Martha releases her own tribute album to another iconic figure in music history, Edith Piaf. Just as Rufus’ penchant for flair and flamboyance made him a natural to recreate Garland’s Carnegie Hall concert, Martha’s emotive style makes her a perfect match to interpret Piaf’s songs. 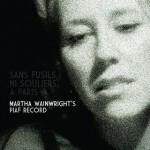 Wainwright is set to release a new album, Sans Fusils, Ni Souliers, A Paris: Martha Wainwright’s Piaf Recordon November 9th in Europe, featuring her own interpretations of Edith Piaf songs, such as “Adieu Mon Coeur”, “Vieux Piano”, “Une Enfant”, and “Le Foule”. You won’t find “La Vie En Rose” here, though, as Wainwright has stuck to covering more rare pieces from the French singer. The album was recorded over three performances in New York in June, and will be recreated in a special one-time performance on November 11th at the Barbican. There’s no word yet on a release date for anywhere outside of Europe, at least not that I have been able to locate. I’m crossing my fingers that it will see a US release, mostly because I’m so tired of paying ridiculous amounts of money to import things.